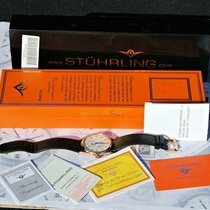 The American watch manufacturer Stuhrling produces sophisticated watches at affordable prices. Their collection encompasses mechanical models with skeleton dials and tourbillons as well as sturdy sports watches with precise quartz movements. The product palette of this New York-based company is very comprehensive. 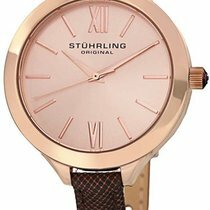 Stuhrling offers sporty watches with precise Swiss quartz movements as well as classic watches with mechanical calibers. Wristwatches resembling pocket watches can be found in their Legacy collection. Skeleton dials provide a view of the mechanical movement and an avant-garde feel. The Aquadiver and Monaco series, on the other hand, feature sport watches. The watches in the Aquadiver series make for perfect companions in wet environments, as they are water resistant up to 200 m. Their design calls to mind the world-famous Fifty Fathoms from Blancpain or the Submariner from Rolex. The Monaco series mostly contains chronographs. These watches with stopwatch functions were inspired by car racing and are reminiscent of the Rolex Daytona from the 1960s. They are powered by quartz movements either from Switzerland or Japan, and have an important advantage: they are precise and low-maintenance. The relatively young company was founded in 1999 by Henry Fischer with its headquarters in New York. Fischer had long been fascinated by traditional watchmaking and as a result, he became an enthusiastic watch lover and collector. Over the years, he came to realize that luxury watches were still unobtainable for most people. During a trip to Switzerland in 1999, he decided to start his own watch company. His goal was to introduce intricate watches to the market at more affordable prices. 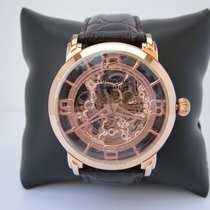 He began by collecting the most famous watch designs and modifying them for his own collections. In its first year, Stuhrling sold 22,386 watches. In 2015, the company sold over a million. Every year, Fischer comes closer and closer to realizing his dream of making luxury watches available for everyone. The manufacturer's namesake is the Swiss master watchmaker Max Stührling. He lived in the late 18th century and specialized in complications such as perpetual calendars, chronographs, and moon phases. The manufacturer builds on Stührling's skilled work and follows his tradition of excellence. Numerous watches from this American manufacturer are mechanical. The calibers that power them are either manual or automatic. The automatic calibers get their energy from a winding rotor which turns with every movement of the wearer's hand. This in turn winds the spring, which serves as an energy source situated inside the barrel. Stuhrling uses partly or fully skeleton dials in most of their mechanical watches. This enables the wearer to view the movements of the balance wheel and the gear wheels. Above all, the Legacy series is well known for its open designs. The Gemini II model and its open design calls to mind the Tradition line from Breguet, with its small dial at 12 o'clock and moon-tip hands. With their Symphony collection, Stuhrling offers more watches with visible balance wheels. 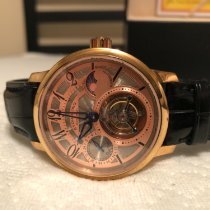 The movements for these watches come from Japan, Switzerland, and China. The watches from the Tourbillon collection are a special highlight in Stuhrling's palette. The mostly classic-looking timepieces have a tourbillon - a balance wheel in a rotating cage - visible from the front side. This innovation was developed by master watchmaker Abraham-Louis Breguet in 1801. During this time, men usually carried their pocket watches with them vertically in their vest pockets. This vertical position, along with the influence of gravity on the balance wheel, led to significant deviations from the precise time. Breguet wanted to minimize such deviations, and therefore developed a turning cage to contain the escapement and swing systems. The cage rotates around itself once every minute and these rotations significantly equalize the deviations. Stuhrling uses this innovation very effectively. Watches such as the Emperor's Tourbillon also have a skeleton dial, showing off its inner workings. The tourbillon is located at three o'clock on this model, while it's at six o'clock on the Imperium Tourbillon. The tourbillon complication is considered the pinnacle of watchmaking, and Stuhrling offers this striking feature at moderate prices so everyone can enjoy its intricate mechanical workings. Stuhrling watches have a wide range of diverse designs. Sporty, stainless steel models rest alongside classic, gold-plated watches. The cases are varied, available in round, square, and barrel shapes. The Vogue collection calls the famous fashion magazine to mind and mainly appeals to stylish women with its decorative watches. Red or pink bands, together with Swarovski gems, emphasize the watches' feminine appearance. The Prestige series combines classic watches such as the Prominent model with powerful sport chronographs such as the Ocean Maverick. The Aviator series, as its name suggests, contains sporty classic watches meant for pilots. These designs were inspired by the famous pilot watches from watch manufacturer IWC Schaffhausen. The versions with skeleton or partly skeleton dials are Stuhrling's avant-garde timepieces. The watches combine traditional features such as Roman numerals and Breguet hands with the stylish skeleton look. The company uses materials such as leather, stainless steel, and silicon for the bands. A distinctive feature of Stuhrling watches is their use of Krysterna crystal. The glass, developed at the beginning of the 2000s, originated in the optics industry. 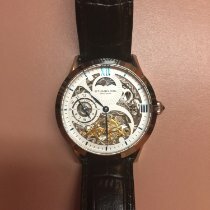 Stuhrling is one of the first watch manufacturers to use Krysterna for the front and back sides of their watches. This type of crystal offers many advantages: it's very scratch resistant and only cracks under heavy loads. Since Stuhrling uses this crystal on the front and back sides of their watches, the movement is visible from both sides. Stuhrling is one of few manufacturers of affordable mechanical watches. Thanks to this, their timepieces appeal to a wide variety of customers. Stuhrling offers luxury watches for everyone, whether you're an employee or the boss. Their extensive product portfolio encompasses mechanical watches with tourbillons, manual and automatic calibers, and precise, sporty quartz watches. Pieces featuring gold-plated cases and Swarovski gems make luxurious impressions, and the striking designs of these watches make them true eye-catchers that appeal to both men and women.